A Russian silver gilt and cloisonne enamel box, with marks for Fedor Ruckert, circa 1908-17 which sold for £62,000 at Lyon & Turnbull in 2007. The antiques market operates on the principles of demand and supply, so rarity is a principal determinant. Buying is all about opportunity and the question 'can you find another at a more favourableprice?' is paramount. It goes without saying, the scarcer the buying opportunity, the greater the demand. Date is a broad but far from irrefutable guide to value. It has to be combined with quality of craftsmanship and scarcity. For example, some ancient domestic pottery or coinage has survived in large volumes. It explains why a Roman glass vessel can be much cheaper than a novel vesta case made in small numbers in the 20th century. However, date is often of paramount importance to objects that have been mass-produced over many years. In the case of a modern design classic such as a Marcel Breuer Wassily chair, those pieces closest to the creative process will be most desirable. 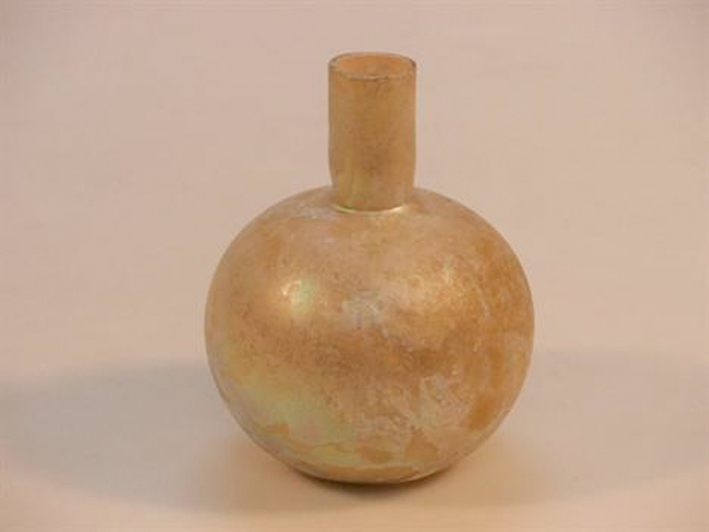 A late Roman glass flask from 4th century AD which made £50 at auction. Damage or wear and tear will detract from value and in some collecting fields, such as diecast toys, where the presence of original packaging can double the price, has become of prime importance. In general terms the more original the item the better and there is, in collecting fields such as oak and country furniture, always a premium to be paid for thoseitems that have escaped restoration and repair or acquired a pleasing surface patina and colour. But just how much condition problems impact value will depend on rarity. Damage detracts less when there are few opportunities to source a better example. The history of previous ownership can add considerable value. This can be as simple as a famous former owner (the market for entertainment memorabilia amply demonstrates the added value of celebrity) or an association with a famous country house, institution or historical event. But provenance can be more subtle: the comfort in the knowledge that an object was once owned by a well-known collector or authority on a particular subject or a history that provides an insurance policy against recent fakes. Most simply, objects that are fresh to the market from a private rather than a trade source are typically more desirable than those that have been 'seen'. In the case of antiquities, which are subject to cultural heritage laws, a failure to provide a provenance can be problematic. There is always security in knowing when and where an object was dug up orentered into the stream of commerce. In short, the more you know about the background and history of a piece, the more attractive it becomes. Knowing the name of who or where a work of art was made is always beneficial. This can be as simple as the name of a town on a clock face that enhances its appeal to local residents or the mark to a piece of porcelain denoting it as the product of a particular factory. In some fields, such as furniture, ceramics or metalwork, many items are destined to remain anonymous, so a signature, maker's name or mark will help distinguish it from the norm. Typically, the market responds positively to new research that helps group previously anonymous objects: the price increases that occasioned the excavations at some of the smaller English 18th century porcelain factories are a case in point. A new book or a high profile exhibition can also push up prices in the same way. Names are particularly important in the decorative arts market where the work of a specific designer or factory is collectable. The terminology used by auctioneers and dealers is often specific: the phrase 'attributed to Christopher Dresser' is typically a much less confident declaration than the description 'by Christopher Dresser'. In the case of mass-produced products it is worth remembering that a prototype, often being a one-off or limited edition made by the artist/designer himself, can have many times the value of the items that left the production line. A silver plate Christopher Dresser teapot manufactured by James Dixon & Sons, stamped with facsimile signature 'Chr. Dresser', marked 'J D & S 2273', lozenge registration mark for 1880 which sold for £3000 at Wiltshire auctioneers Gardiner Houlgate. Tastes for art and antiques change just as they do in everything else. The art market is littered with once-popular artists whose star has dimmed or whose work was largely unappreciated until it was reassessed by future generations. The market is in a permanent state of flux, reacting to social change (that has seen a much-reported fall in demand for formal dining furniture and silver for example), demographics (that sees each new generation reassess the design movements of the past and present) or global economics (that has seen markets soar in rapidly expanding economies). In the case of the burgeoning market for Chinese works of art, taste dictates that the highest prices are no longer reserved for the early blue and white porcelain long valued by Western collectors but by the decorative exuberance of wares from the Qing dynasty loved by the Chinese.